Listen to Chuck Swindoll’s overview of Nehemiah in his audio message from the Classic series God’s Masterwork. Jewish tradition identifies Nehemiah himself as the primary author of this historical book. Much of the book is written from his first-person perspective. Nothing is known about his youth or background; we meet him as an adult serving in the Persian royal court as the personal cupbearer to King Artaxerxes (Nehemiah 1:11–2:1). This prestigious position reveals something of Nehemiah’s upright character. Though he remained in Persia after the exiles had been allowed to go home, he was highly interested in the state of affairs in Judah (his brother Hanani [1:2] had returned there earlier). The book of Nehemiah could be read as a sequel to the book of Ezra, and some scholars believe the two were originally one work. It is possible that Ezra compiled Nehemiah’s original accounts with other material to create the book of Nehemiah. 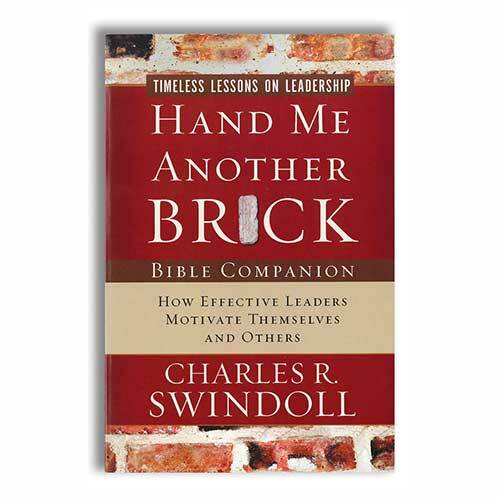 However, most scholars believe the book was written by Nehemiah. The book of Nehemiah opens in the Persian city of Susa in the year 444 BC. Later that year, Nehemiah traveled to Israel, leading the third of three returns by the Jewish people following their seventy years of exile in Babylon. (The previous chapter on Ezra describes the earlier two returns.) Most of the book centers on events in Jerusalem. The narrative concludes around the year 430 BC, and scholars believe the book was written shortly thereafter. Under Nehemiah’s leadership, the Jews withstood opposition and came together to accomplish their goal. Nehemiah led by example, giving up a respected position in a palace for hard labor in a politically insignificant district. He partnered with Ezra, who also appears in this book, to solidify the political and spiritual foundations of the people. Nehemiah’s humility before God (see his moving intercessory prayers in chapters 1 and 9) provided an example for the people. He did not claim glory for himself but always gave God the credit for his successes. 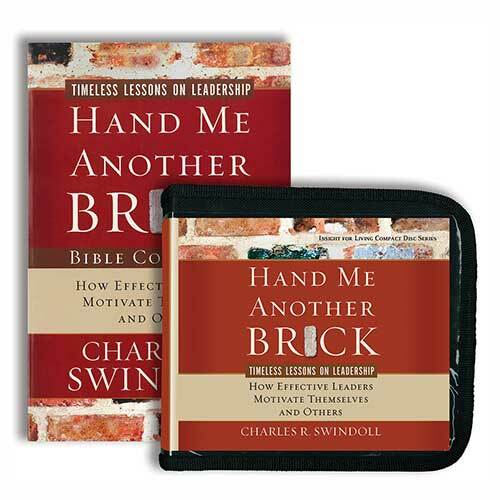 Nehemiah’s life provides a fine study on leadership. He overcame opposition from outsiders as well as internal turmoil. 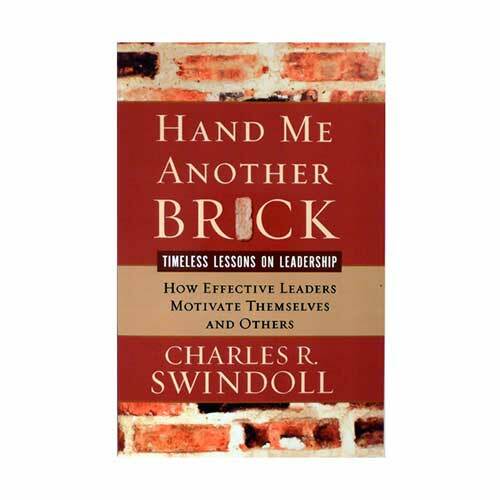 He exercised his administrative skills in his strategy to use half the people for building while the other half kept watch for the Samaritans who, under Sanballat, threatened attack (Nehemiah 4–7). As governor, Nehemiah negotiated peace among the Jews who were unhappy with Persian taxes. He exhibited a steadfast determination to complete his goals. Accomplishing those goals resulted in a people encouraged, renewed, and excited about their future. The book of Nehemiah shows us the kind of significant impact one individual can have on a nation. Nehemiah served in secular offices, using his position to bring back to the Jews order, stability, and proper focus on God. God uses all manner of people in all manner of places doing all manner of work. Do you feel you must be “in ministry” in order to serve God? Be encouraged; He is not limited by your vocation. In fact, God has placed you where you are for a purpose. Have this attitude about your work: “Whatever you do in word or deed, do all in the name of the Lord Jesus, giving thanks through Him to God the Father” (Colossians 3:17). 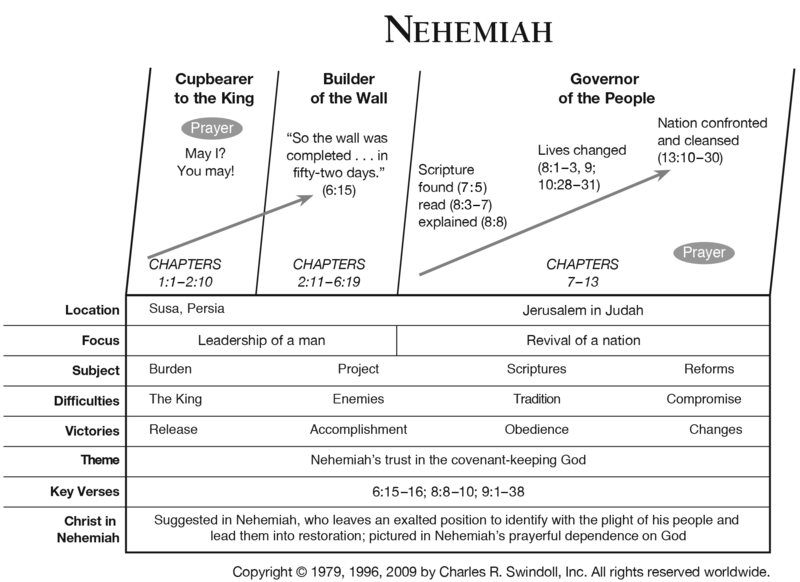 View Chuck Swindoll's chart of Nehemiah, which divides the book into major sections and highlights themes and key verses. Discover more resources related to Nehemiah.